Barns and Nobles has a mini firefly they came out with for Christmas. It has a box and a cute book too. They already re-released her a while ago. That's not really a re-release that's just a little mini figure of Firefly. There is a Glory like that too. I can't find these ANYWHERE or online. Did they only release on the east coast or something? I watched a YouTube review on them and he did state Target is only selling them in store only. Not sure if its true but check out Derpyderps Review on them. https://www.youtube.com/watch?v=Us-_gfB-H3Y If you watch this clip closely, I think I see Firefly! 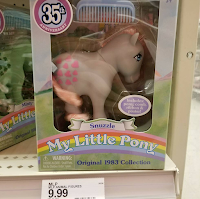 They look more similar to the originals than the previous retro pony set of these (10 years ago, I guess). It's good I think. I wish they would sell these in Finland, because if so, I would buy at least a couple of them. Yes, please! Hope Hasbro makes more! Would love to see some of the Year 2 & 3 ponies hit the shelves! I hope they have them in the U.K soon. As I've got my eyes on Butterscotch and Minty. When will these be available for purchase at Target? 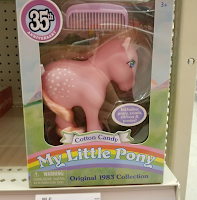 I found all but Cotton Candy this morning at Target. Which target store were these found? I have gone to 3 of them and no one seems to know what I am talking about when I ask them. Help!!! Hey everyone, I am a SUPER vintage pony lover! I happen to be walking into target one day and FOUND one on the shelf, To my surprise I was fortunate to find one lying around. I soon asked the employee if they had anymore and they checked their stock system on the computer, they said no they didnt have anymore and said that the next town over had 6 in stock! So we drove to the next town and I was asking the employee and Im sure thought I was crazy but I kept showing her pictures online because I could not find it anywhere on the shelves. I told her it may be in the stock room, since I was told from the other store they just had six. Perhaps they weren't even on the shelf yet being that it was only 1 shipment of 6 ponies they received. They needed a barcode to look it up so my husband happen to find a barcode from one of the images to search their system. sure enough they looked it up and saw they had 6 in their store! 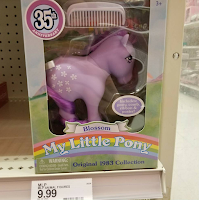 She said they were in the stock and as soon as she came out they had 1 of each pony! I was able to get all six! 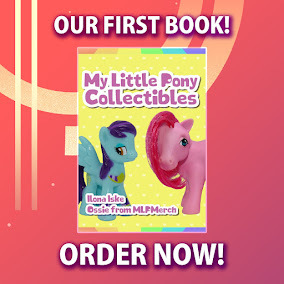 NO one knew what these ponies are about, being that they just came out on January 4th? from what I read. I was lucky! dont give up! 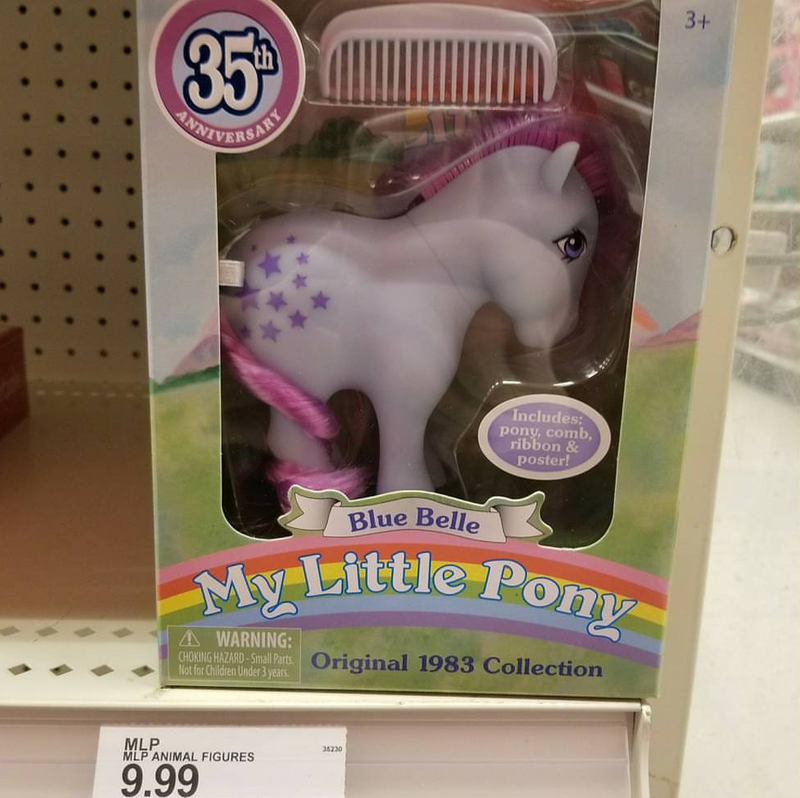 call your targets find the barcodes from an online picture someone posted and ask if they can search if they have any in stock! If they DO, its most likely not even on the shelf! they will have to go in the back and get them for you, IF they have any, i think all targets only got one set. but they may have them in their stock room being that the target I went to didn't even have them on the shelf! dont give up!!! Would love to see MIMIC! 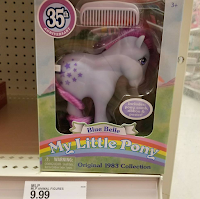 I have heard unfortunately, each target only gets one stock of these ponies, and after they have all been sold out, there wont be more for a very long time. I found all of them! So glad to have them! Okay, every pony calm the hay down. Spring resets are just barely happening at Walmart and Target. The initial wave of product is always slim/light. I’m a merchandiser for Hasbro in UT and I just barely got the new Spring MOD list. If you are trying to find them have a Target associate key in the DCPI #. If you click on the pics you’ll see it starting with 087. I found 2 at a Target in Burbank on January 10th. They were sitting on an end cap. 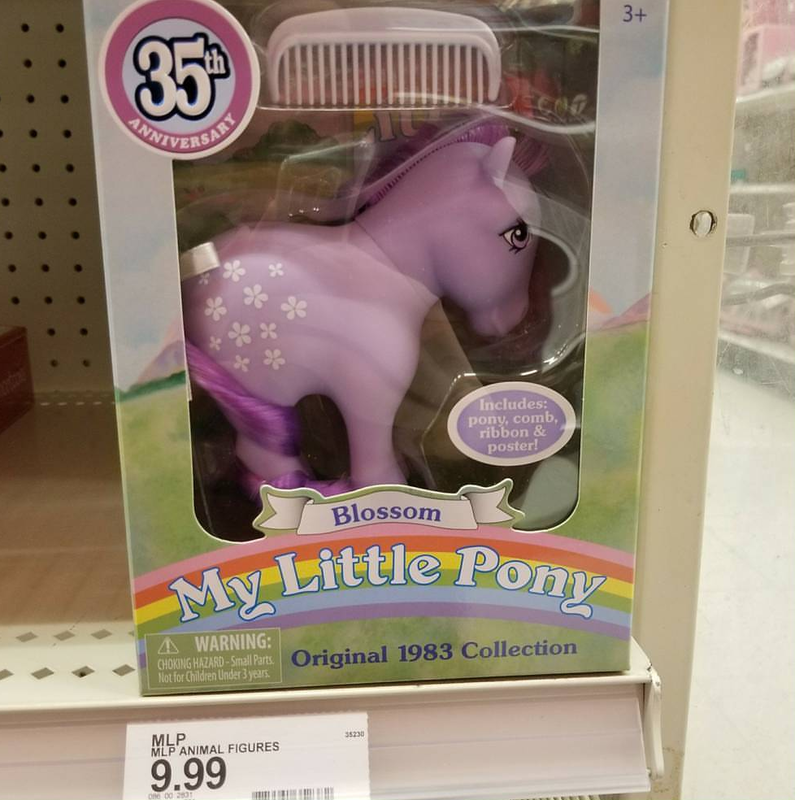 I've checked twice a week since then and new MLP merch has been put out, but no more of the anniversary edition ones. I hope they make Firefly she's my most favourite G1 Pony! Has she been released remade yet? Anyone know? Twice. 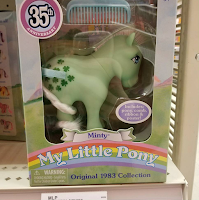 Once in a miniature book and toy set, once in The Loyal Subjects MLP set. They are on an end cap, where the retro toys are...ie the old playskool toys etc. 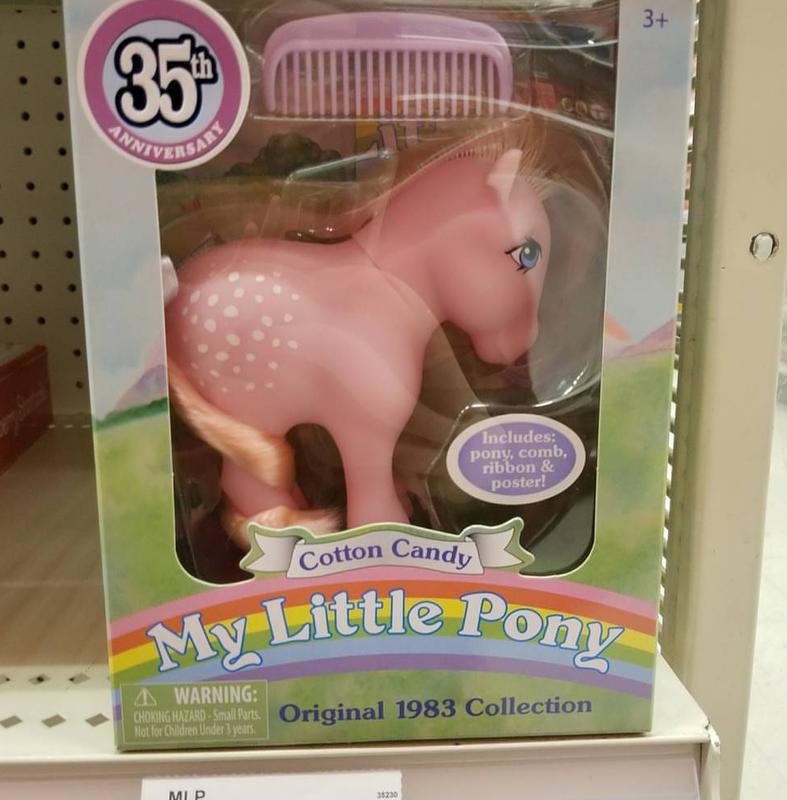 Not in the pony aisle. I have all but minty. I'm in NH! I saw it speculated that Targets were receiving only one set at first, but several Targets in Texas have multiple full sets. 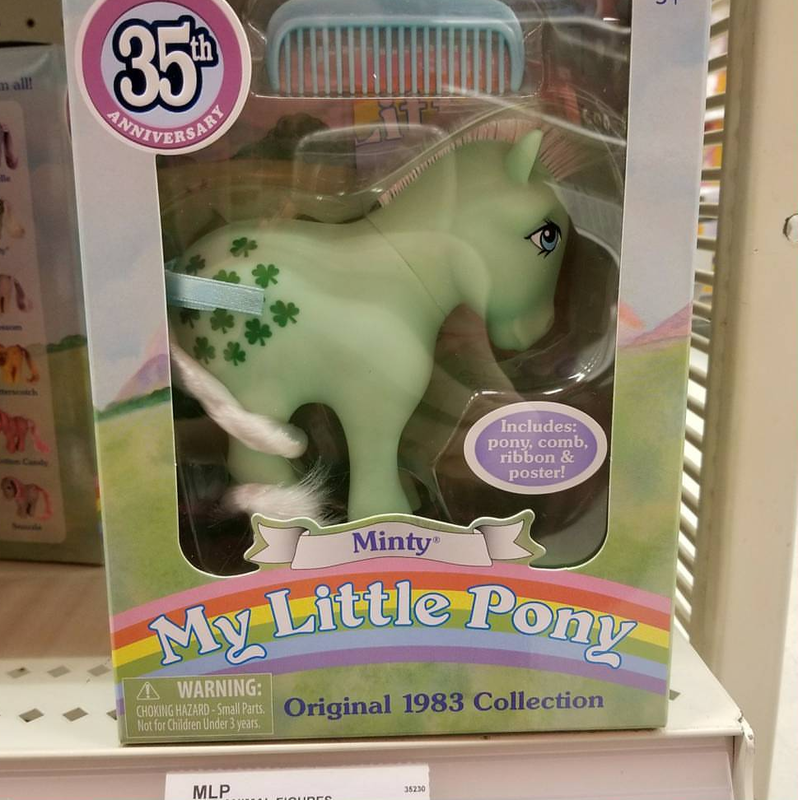 Does anyone have the full store DPCI for Minty? 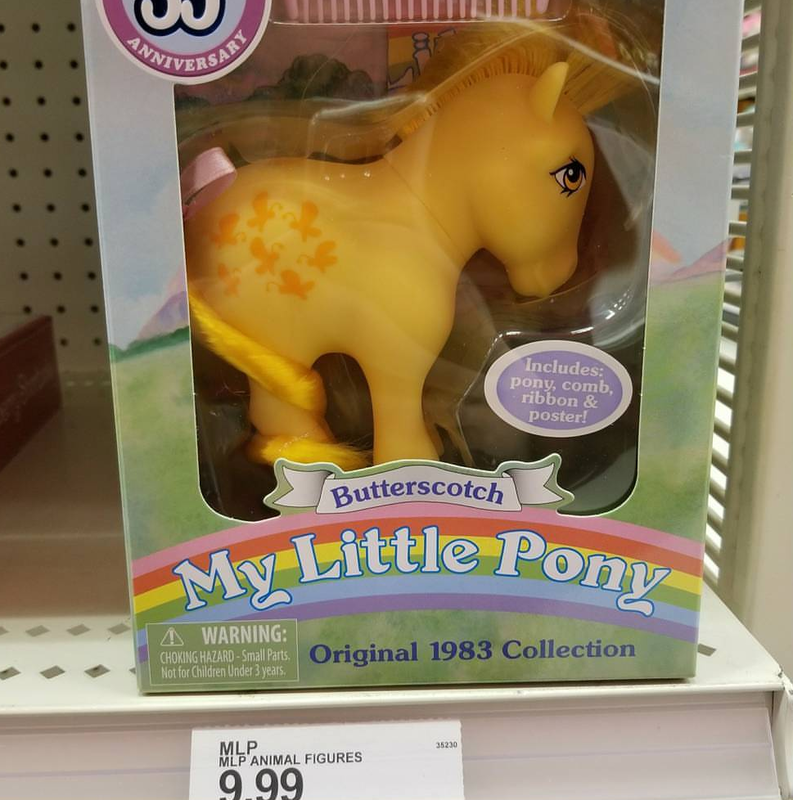 Purchased Butterscotch at Toys R Us liquidation last week. We've seen all six at Target, one of each, and they were gone the next time we went. Awesome. I'm considering buying these for my sisters for when their birthdays come up. And that's the generation we grew up with. I'm 28, and my two out of three sisters whom were collectors are in their thirties now. Start looking again. I just found 4 today at Target. Never found them before. I all but gave up trying to find them. Has anyone found the rainbow ponies at Target, which were supposed to be released this month? They are on eBay, but I can't find them on Target's site, though I found the Pretty Parlor with Peachy.